Fire Tom Coughlin? | Vote now – Fire his A**! or S*per B*wl Baby! Vote now – Fire his A**! or S*per B*wl Baby! 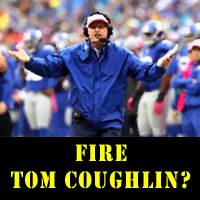 Fire Tom Coughlin or Not? Bring on the comments. As a big fan of man, from his BC days coaching Flutie to his two victories in the big game, I say he should be made “Coach for Life.” Agree or disagree, share your thoughts here.